Do you have a new bundle of joy here or on that way? If you want some assistance announcing the new arrival using custom photo cards, check out Cherry Blossom Greetings. 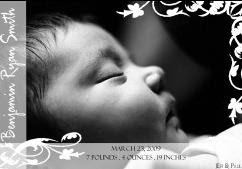 The company offers pre-designed announcements for new baby, birthday, weddings, and other religious occasions. All you have to do is pick a design, and send them a digital photograph. You'll receive back the finished design, in digital format (JPEG), with your baby's photo. You can take this file and have it printed from any photo processing store, whether you do that online or take it in person to a store near you. Or, you can opt for Cherry Blossom Greetings to print them for you and have them mailed to you! This is a great service if you don't want to try and design an announcement yourself. And the cost starts at just $10 (from design to digital proof; not including printing)! This is a special introductory price, and only available for a limited time. Cherry Blossom Greetings also has designs for weddings, birthdays, and religious invitations. For all the details and to view the designs, visit www.CherryBlossomGreetings.com. 0 Response to "$10 Custom Photo Announcement Designs by Cherry Blossom Greetings"